The practice of mindfulness has a huge effect on my well-being and my creativity. When I move mindfully through my day I am able to observe the sensations, emotions, and thoughts that pass through my mind and body without judgement and without struggle. I am able to stay calm and peaceful, and I am better able to act on creative ideas that bubble to the surface. Mindfulness is also one of the things I struggle with the most. I am much more likely to get caught up in and fight my anxiety than to peacefully watch it come and go. So any practices that help me create habits mindfulness in my daily life are good ones. When I wash the dishes - and only wash the dishes, without TV or an audio book to distract me - I often feel my nervous system calming down. I focus on how pleasing it is to rinse a clean dish, and I try to soak up the feeling of satisfaction that comes from clean counters. 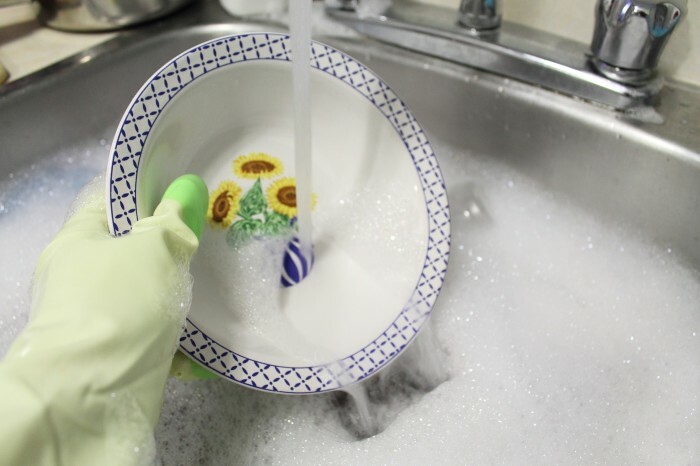 I can honestly say I've never regretted washing the dishes - it almost always puts me in a better state of mind than I was in before. This probably sounds really weird but, given what I said above, it kind of makes sense. A couple months ago I was having a hard time staying asleep. I was waking up numerous times in the night, tossing and turning, and feeling exhausted in the mornings. After paying attention to my bed time routine, I noticed that I often feel tense before bed. It felt like I wasn't quite ready to let go of the day - like something else needed my attention. So I tried a few things to help me calm the anxious feeling: taking a bath, reading, journaling, drinking warm milk, tidying my apartment, and doing the dishes. What had the most noticeable effect? Tidying and doing the dishes. I found that after these activities more than any others my body felt relaxed and my mind felt calm. And I started sleeping through the night, not waking until my alarm went off. At first I thought that standing at the sink every night was just tiring me out, but now I think of it as a signal to my body that everything is finished and I don't have to worry any more. This discovery has made a huge difference. When I get a good sleep and I wake up feeling refreshed, I'm calmer and more likely to have creative ideas. When my sleep is restless I have scary dreams and wake up feeling anxious and fearful, making it very hard to focus or accomplish anything. This means that even on nights when it's late and I just want to fall into my bed, or my apartment is blisteringly hot, or I don't feel well, I think about how much better a good sleep will make me feel and I get up and wash the dishes. Waking up feeling refreshed and stepping into a clean kitchen to prepare for my day gives me such a positive head start. The morning feel so much more relaxed when I have clean counter space to prepare my breakfast and pack my lunches. And when the table is clean it feels like an invitation to pull out my laptop or a sketchbook and do some writing or drawing. On mornings like these I can't wait to jump into my creative work, whether I'm at home or heading in to the office. When I start my day with energy and excitement I get more done and I feel more satisfied by what I do. Other chores, like getting groceries, cleaning the bathroom, doing laundry, start to feel less like a waste of time and more like a piece of the same meaningful process of self care and rejuvenation. Turning a boring chore into a meaningful ritual every night sets in motion a chain of feelings and actions that help me feel good and stay creative all day long. Are there any seemingly meaningless tasks in your life that you can turn into an opportunity to practice mindfulness and help you feel better in general? Leave a comment below!